This collage is digital, but was made from a scan of an actual painting done on paper, plus a scan of some sequin waste, and the curvy colored strokes were done in Illustrator. All of it was finalized in Photoshop Elements. I’m getting addicted to working this way. The possibilities are endless. We had what was probably our last lettuce from the garden tonight for dinner. It was kind of frozen. Last night the temps got down to 20 degrees F and I don’t think the rest of it will make it either. But the last big head of broccoli looks fine and there are several more little side shoots on the rest of the plants as well. Of course, if that ends up freezing too, I’ll just harvest it all and toss it into the freezer. 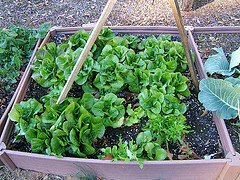 Note: The lettuce bed didn’t look this pretty toward the end. We had pretty much cleaned it out already anyway. I love having lettuce almost the year around. Some day I’ll build some cold frames and keep it going. Martha, this is an inspiration. Colours, textures……. Oohh, thank you, Myfanwy! Glad you like. Yes indeed! working with digital imaging regardless of the image source is very, very addictive. This is especially the case when one uses photoshop or corelphotopaint and makes use of the layering process. As I weave layers in an out and over and under each other I will take a snap shot of the structure and save to disk. There are times I have nearly 50-60 different versions of an image structure setup. Sweet! 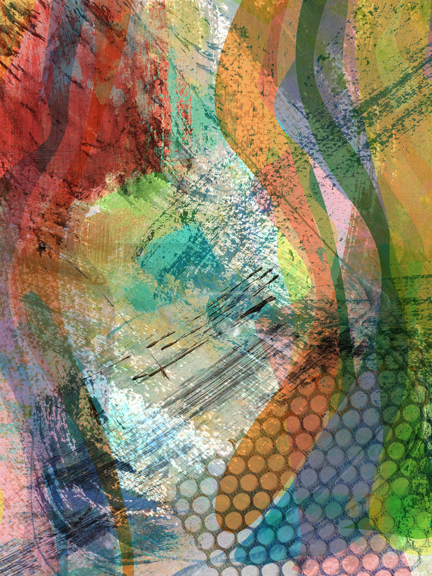 And digital collage, as I call it, what can I say? Wherever the imagination takes you go for it. And to top it all off, This kind of imaging never takes up any rack space in the studio. And when you are ready to make a print, have Walgreens do it. Saw some of their printing the other day. Yikes! great quality and cheaper than buying HP inks, going through the mind bends to match colors, etc. Want a print on canvas? Online printing is great these days. Back in the mid 1980’s I once said, “What would I ever do with a computer?” My son never lets me forget this questioning. David, I absolutely love getting deeper and deeper in image creation on the computer. Great tip about Walgreens printing. I do know that you know a thing or two about print quality!! So thanks for that little gem.